"The owner has not demonstrated to the satisfaction of the Historic Conservation Board that the structure cannot be reused nor can a reasonable economic return be gained from the use of all or part of the building proposed for demolition," said board member Judith Spraul-Schmidt in reading the motion. "And finding second that the property owner has not demonstrated by the preponderance of the credible evidence that it will suffer economic hardship because the applicant did not consider the use of tax credits and the applicant has not offered the property for sale." On Thursday, the board heard arguments from two preservation groups in the city who want the building saved. It also heard public comments on both sides of the issue. The building's owner had made arguments during a hearing last month. Resident Brendan Regan has worked to salvage other historic buildings. "And the building is in good shape compared to many historic buildings that I've seen rehabbed," said Regan. "It's doesn't have any major issues like bowing walls, huge cracking in the masonry, big foundational issues, joist failure, and the roof appears to be fairly intact and fairly solid." Attorney Sean Suder, representing the preservation groups, began his presentation by stating the other side was attacking the city's process that could lead to demolition. "Now in my experience, when one starts their case by arguing that the process is unfair rather than focusing on the merits of their case, it usually indicates that their case lacks merit," said Suder. "And this case is no exception." The Dennison is currently owned by Columbia REI, LLC. It has argued the building cannot be reused. It wants to tear it down and let the site sit empty while a new development plan is put together. Attorney Francis Barrett, who represents the owner, said they are disappointed and will appeal. "We've demonstrated and our client's experts have proven that it's not economically feasible to rehab and occupy this building," Barrett said. Attorney Tim Burke, representing the owner as well, said he knows the city's urban conservator has strong feeling about the building. And some in the community have been making strong emotional arguments. "None of that changes the expert testimony that you've received, under oath, from some of Cincinnati's leading experts when it comes to evaluating the economic feasibility of doing a project," Burke said. 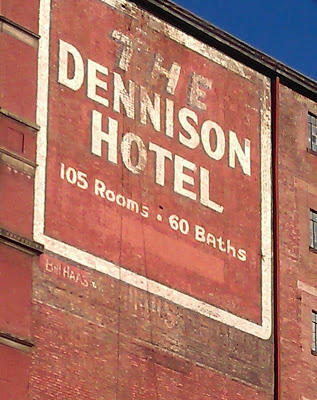 The preservation groups said during the hearing there are as many as eight different development firms interested in rehabbing the Dennison. But Barrett said there is not real interest by anybody in the building. He said if there had been it would have happened over the past 25 years. He says the apparent interest only surfaced after the application for demolition was filed. The case will now head to the city's Zoning Board of Appeals. That process could take two or three additional months. Ultimately, a Hamilton County Common Pleas Court judge will likely decide whether the building can be demolished.